Recently New York Governor Andrew Cuomo released the 2012 budget from the state’s capital here in Albany. Included in the $132 billion budget proposals are $15 billion in funds set aside to improve New York’s infrastructure. Part of that project is going to be building a new Tappan Zee Bridge that will be go right alongside the existing span. If the budget is approved and the money is allocated that’s going to mean a lot of new construction projects starting around Albany and throughout the rest of the state. That’s good news for many workers who have been sitting on the sidelines waiting for the chance to get back in the game. Major construction projects have a very positive impact on the economy. Not only does it put money into the pockets of those construction workers but those funds also trickle down to many ancillary businesses. Everything from food trucks to material suppliers to waste removal companies will benefit from these construction jobs. When it comes to construction waste removal this is a phase of any project that needs to be properly planned. The amount of construction waste generated by the demolition of an apartment building or excavation for a new road could be huge. We’re talking tons of debris and dirt. All of that has to be hauled away just as quickly as it’s been created in order to make room for incoming equipment and the erection of the construction project. This makes construction waste removal of vital link in a major infrastructure project. 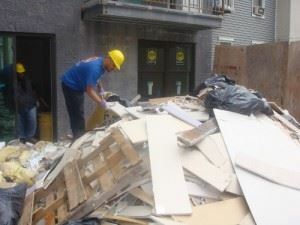 If you were to scale down that construction project to something like a home remodeling job then you would still be facing the need for immediate construction waste removal. On some level it’s even more important around your own home. If you are tackling a remodeling job like adding a new bathroom or completely making over your kitchen then you’re going to be doing a lot of ripping out of cabinets, floor and walls. That’s going to make heaps of trash that won’t fit in your small garbage can. You certainly don’t want to keep those piles of waste stacked outside your house where kids might end up playing. That’s why on the day of the demolition you should schedule a group of professional garbage haulers who will be standing by to take away all that construction waste. While it is true that your contractor might offer these removal services as part of his job, you might be in a stronger position to contract your own professional construction waste haulers like Junk King Capital District. For one thing, it might be more affordable than going through a contractor who will be marking up those types of services. But it can also allow you to take advantage of these junk haulers to not only take away all your construction waste but also haul away any other junk you might have lying around the house. While Albany’s infrastructure is getting repaired and your home is getting fixed up make sure all that trash will be taken away! This entry was posted in Albany Junk Hauling, Albany Junk Removal, Construction Waste Removal, Demolition Cleanup, Get Rid of Junk Albany, Junk King Capital District, Schenectady Junk Removal and tagged Albany Construction Waste, Albany Junk Removal, Junk Hauling Troy, Troy Construction Waste on January 30, 2012 by Todd Porter. Last updated August 1, 2017 . A perfect example of one of the many great Albany businesses can be found with Metro Mattress. They have been in business in the Upstate New York region for over 35 years and in that time they’ve become the area’s leading “Sleep Superstore.” While Metro Mattress could simply rest on its laurels, it does more than just sell mattresses; the company gives back to the community. For the past two years, Metro Mattress has sponsored the “50 Beds in 50 Days” program. Since the inception of this mattress giveaway, Metro Mattress has donated over 400 beds to help folks and social service centers provide comfort for a good night’s rest. This year 21 charitable organizations in Albany and the Mohawk Valley will be on the receiving end of brand new mattresses for its clients. All of this begs the question: What are you sleeping on? If you find yourself in the fortunate position to go mattress shopping it’s a safe bet you haven’t been to a mattress store in over five years. That’s the average life of a mattress. If you’re sleeping on a mattress that is older than five years it is definitely time to be thinking about getting a replacement. Shopping for a new mattress is going to require you to feel silly for a few moments. That would be when you stretch out in a showroom, fully clothed, on a mattress to see if it’s going to be a good fit. For all practical purposes, this is the wrong way to see if a mattress is going to be comfortable. First of all, you’re not going to get an actually feel for the mattress bundled up in your wintery sweaters and coats. That’s not to say you should go shopping for a mattress in your pajamas! But keep in mind that no mattress is going to feel the way it does in your home as it does in the showroom. That’s why you need to take a good look at the mattress store return policy. Most mattress manufacturers will tell you it takes an average of 2 to 4 weeks for you to really “settle” in to your new mattress. This might mean a few initial uncomfortable nights while your body adjusts to the new sensations it is sleeping under. However, if several weeks go by and you still can’t get comfortable, it might be worth swapping out that mattress. 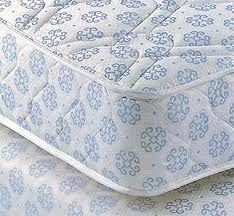 You should have a return policy that allows for that provided that the mattress hasn’t been damaged in anyway. Hopefully, you will make the right choice with your first choice. For the best in Albany Mattress Disposal, or any sort of junk removal needs in NY’s Capital District, simply call 1-888-888-JUNK or book a free on site estimate online. This entry was posted in Albany Furniture Disposal, Albany Junk Removal, Albany Mattress Disposal, Get Rid of Junk Albany, Schenectady Junk Removal, Troy Junk Removal and tagged Albany Junk Removal, Albany Mattress Disposal, buy mattress albany, capital district hauling, Get Rid of Mattress, Metro Madness, Troy Mattress Disposal on January 25, 2012 by Todd Porter. Last updated August 1, 2017 .